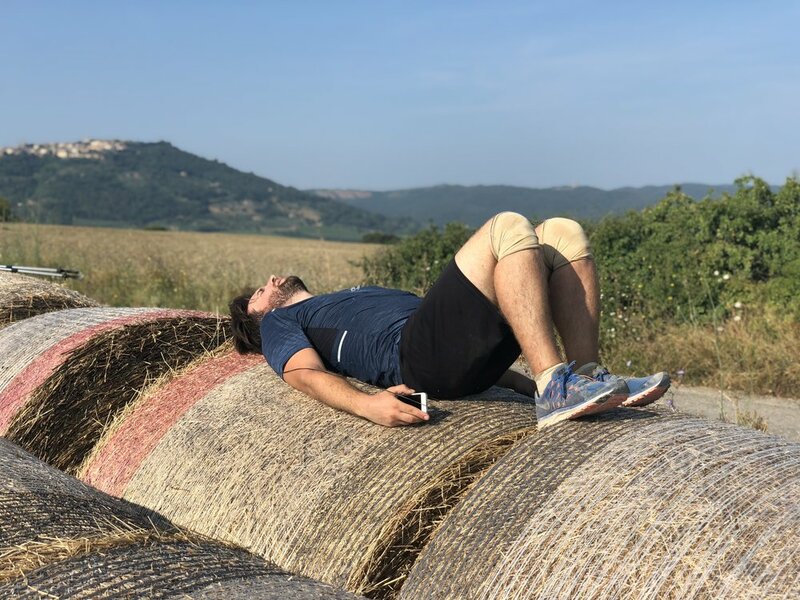 Today saw 25km if walking to San Quirico, 3 pilgrim goodbyes, some new friends, and a some kind of breakthrough with the aches and pains I have been experiencing on the trail. We started from Ponte D’Arba in the dark on a long trail, with no coffee at the hostel and the promise of a cappuccino / brioche seeming to be faraway. But we came to the smart town of Buonconvent at last. It was literally bittersweet because the chocolate brioches was fresh and warm, but our friends following the Assisi trail had to go a separate way. After many hugs and pictures, we found the trail again. I found a lot of energy in the sun, and it seemed with my new sneakers I could walk forever. There were few stops on the way, so we improved with big round haybales. I stretched backwards on one like i had been dreaming of. We passed some unique trees and I realized I was only nine days from Rome. Suddenly I just wasn’t worried about my back. I felt it was getting better every day, like my bugbites were almost healed, and I had a surge of faith I was going to make it in my own way. I walked quickly when the sun got hot, and was one of the first to reach the city. I put my legs up on the hard cot in a stretch and closed my eyes. I knew the drill by now, and could already imagine the pain of these long walks, hard beds, and sweaty nights, dark mornings and mosquito bites transforming into a sweet memory, but not yet. I took a breath and felt the peace of the moment.